Let us settle all the booking for various Kiruna and Abisko winter activities for you. Self-drive dog sledding duo, there are two kinds of screenings at noon including lunch and the opportunity to watch Aurora in the evening. You can drive in rotation and experience a 3-hour dog sled trip. Seven dogs pull a wooden sledge through the forests. You can enjoy the beautiful scenery of the surroundings. You can take pictures of many polar beauty scenes in the daytime field and watch the aurora in the night field. 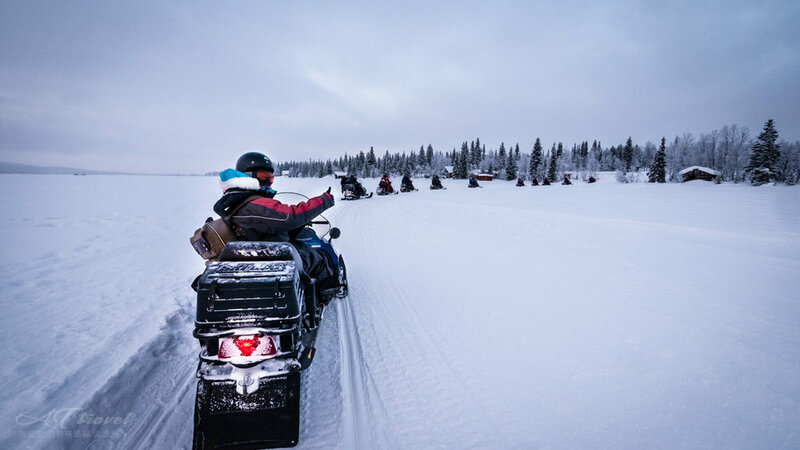 Join us for an unforgettable snowmobile trips in breathtaking natural areas of Kiruna. Let it be your greatest winter adventure. Duration: Around 6 hours. You can ride a snowmobile to Icehotel and have 3 hours of free time. You can visit the Icehotel (entrance tickect extra) or take photos around Icehotel park. Two people a car, you can take turns riding go and return. 1595 kr/person for driving snowmobile with two people on each machine. 1800 kr/person for private driving one person on the snowmobile. You are sitting on a big wooden sled with a guide driving you through the Abisko mountain forest. You can enjoy the surrounding nature and landscape, take plenty of photos and ask the guide about the Alaskan Husky dogs team that are used in racing. Just break the ice and try your luck at ice fishing. On the water covered by ice is using a special drill to make a hole. Sometimes it can be more than one meter thick. Not let You cold we also take a care of worm drinks. Take a day trip to the Sámi village of Rávttas, 45 minutes east of Abisko and experience a glimpse of the traditional lifestyle of the reindeer people. This exclusive, once in a lifetime opportunity allows you to experience the amazing lifestyle of the Sámi people and to get up close and personal with Laplands most iconic creature – the reindeer. During this exciting adventure you will have an opportunity to feed the reindeer and absorb the magical relationship between the Sámi and their most cherished resource. During your visit to Rávttas you will also have an opportunity to enjoy a short ride on a traditional sled behind a reindeer just as the Sámi people have done for hundreds of years. After your ride you will have a chance to learn how to identify different reindeer in the herd based on personal characteristics and behaviour. All of this excitement will most certainly make you hungry – your guide will lead you to one of our traditional Sámi lavvus (teepee) where you will be served a fresh and delicious meal around an open fire. This glimpse into traditional Sámi life will be one of the highlights of your visit to Abisko! It is said that you must to see Aurora at least once in your lifetime. We drive a snowmobile under the moonlight and search the Northen Lights makes the most exotic and memorable experiences. During the tour we stop and have a hot drink. Duration ４－５ hours. Join us for an unforgettable snowmobile trips in breathtaking natural areas of Abisko. Let it be your greatest winter adventure. Duration: Around 2 hours. You can chose sitting in the sled behind the guide driving the snowmobile or you can chose driving the snowmobile yourself. 1250 kr/person for driving snowmobile with two people on each machine. The Ice Hotel, built from ice and snow offers you experience never to be forgotten. You can see amazing individually sculptured Ice statues, Rooms and even the ice chapel and ice bar that is popular for couples getting married. It is adventure for those, who are interested in novelties and unusual environments. Price: 1395kr/person Minimum 3 people. Narvik fjord is the longest fjord in Nordland region with a stunning beauty landscape and You can explore it Yourself ! During the trip we stop at the most beautiful spots and make amazing pictures. In Narvik You make a 2 hours sightseeing and if you want you can buy fresh caught fish for your dinner. Adrenaline and vertical ice. Abisko is a perfect place for trying out ice climbing. We start with fitting the equipment and then drive to one of our climbing areas. After an introduction on tecnique, you get to start climbing. It´s not only a fun and exciting activity, it also takes place in a breathtaking and beautiful place surrounded by frozen waterfalls in all shades of blue. Take the opportunity to try it!